What makes a leader? Ask around and you’ll hear the words: commitment, confidence, communication, honesty, intuition, inspiration. Each time I arrive at this subject, figures of the past often come rushing to mind. 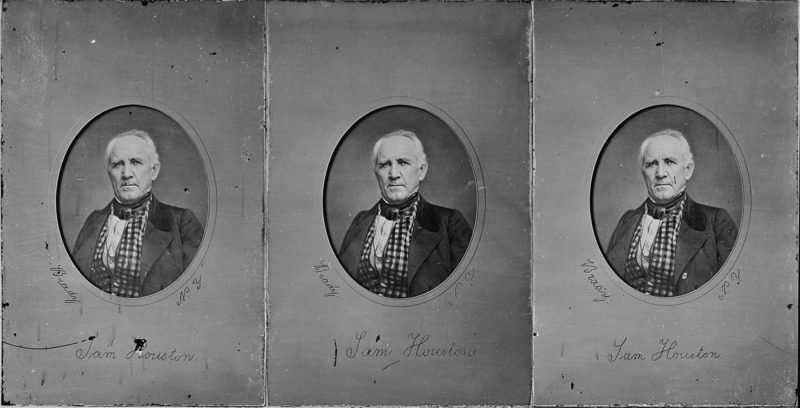 Today, it is Sam Houston. Such words could stand in reference to so many of the political adventures which occurred during the course of Houston’s brimful career as a lawyer, decorated soldier, military general, revolutionary, congressman, governor, and president. His exploits as a hard drinker and philanderer notwithstanding, Houston, while in the spotlight of leadership, can most accurately be described as clairvoyant and steadfast. He laid back while in the throes of a seemingly unwinnable revolution against Mexico when all those he commanded held him in contempt for his unwillingness to budge as time ran out on the defenders of the Alamo. For his resistance he was able to lead a ragged flock of ruffians to victory and secure the founding of The Republic of Texas, a feat which earned him two presidential elections during a 10-year period of Texas Independence. As president – in spite of a split in public opinion – he recognized the reality that Texas could neither sustain herself economically nor militarily, and he insisted that annexation to the U.S. was the only hope in salvaging that which was left of a fading young nation. Before the end of his political career in 1860, Houston would stand alone on many other issues: supporting Indian rights to land ownership before it was en vogue; opposing the Kansas-Nebraska Act for fear that it would cause no more than unnecessary bloodshed (which it did); refusing an offer from Abraham Lincoln that would give him command of 20,000 Union troops because he would die before he would fight against Texas; relinquishing his seat as Texas Governor for refusing to take the oath in the adjoining of Texas with the Confederacy because he could not bear the idea of watching Texas fall to the flames of siding with the South. Houston reportedly once even turned down the challenge to a duel with David G. Burnet during the days of the Texas Republic, insisting to Burnet – who was over a foot shorter in stature – that he “refused to fight downhill.” For his critics who often insisted that he was a war-monger, Sam proved to be undoubtedly competent when it came to picking battles. He knew when to say yes and when to say no, when to step up and when to back down, and quite possibly more than anything else: he knew how to do whatever found to be right whether his beliefs were backed by popular demand or not. Though a controversial figure during his life, Houston’s portrait as a leader has inspired pride in his successors for all time since his death.